Newport-Mesa Audiology, Balance and Ear Institute Integrates S-Tone® Technology Developed by University of California, Irvine Into New Treatment Program for Tinnitus. NEWPORT BEACH, CALIF. (March 26, 2012) – Newport Mesa Audiology, Balance and Ear Institute (the Institute) announced today a new program to treat patients with tinnitus (ringing in the ears) that features S-Tone technology developed by leading hearing researchers at the University of California, Irvine (UCI). The advanced sound therapy system is called “Serenade®” and uses S-Tones® to provide relief and deliver long-term benefits when used as part of a complete tinnitus treatment program. According to the National Institutes of Health, National Institute on Deafness and Other Communication Disorders, tinnitus is commonly described as a ringing in the ears, but it also can sound like roaring, clicking, hissing, or buzzing. It may be soft or loud, high pitched or low pitched in either one or both ears. In the past year, experts estimate that more than 22 million adult Americans experienced tinnitus for more than three months, which is roughly 10 percent of the adult population of the United States. According to SoundCure™, the manufacturer of Serenade, researchers at UCI began working with a patient with a cochlear implant who was suffering from tinnitus in 2006. Traditional treatment approaches were attempted, but failed to provide relief. They applied a low frequency sound, at a comfortable loudness via the patient’s cochlear implant and discovered this relieved the patient’s tinnitus for the first time in two years. All the patient heard was a calming, pleasant tone produced by the low frequency stimulus. Transferring this technology from a cochlear implant to sounds anyone could hear led to the creation of S-Tones, the foundation of the SoundCure Serenade technology. The Serenade device consists of a handheld patient device to generate sound therapy, earphones, and pleasant treatment sounds that are intended to address the underlying cause of tinnitus. 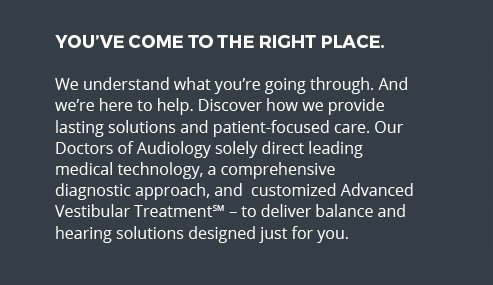 A suite of three different types of sounds is included, enabling the audiologist to determine the specific clinical approach that is most likely to be effective for each patient. Unlike most treatment methodologies, Serenade is customizable and can be programmed to meet the unique needs of each patient, day or night. Tinnitus is not a disease. It is a symptom that something is wrong in the auditory system, which includes the ear, the auditory nerve that connects the inner ear to the brain, and the parts of the brain that process sound, said Dr. Mango. 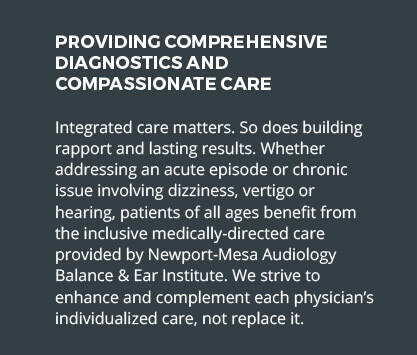 It can also be the result of a number of health conditions, so it’s important for patients consult their physician who can refer them to an audiology practice like Newport-Mesa Audiology, Balance and Ear Institute to diagnose and treat the disorder. Newport-Mesa Audiology Balance and Ear Institute (www.dizziland.com) is one of the country’s leading institutes for the research, diagnosis, treatment and rehabilitation of patients with dizziness, vertigo and balance disorders. 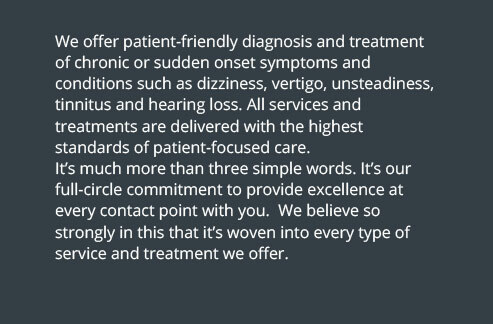 A team of doctors of audiology work with state-of-the-art technology in the areas of vestibular diagnosis and rehabilitation. The Institute is also one of the nation’s most well-equipped audiological facilities, serving an ever-growing number of adult, teen and pediatric cases. 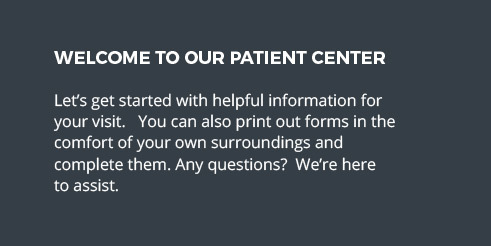 The Institute receives referrals from a broad network of physicians including neurologists, otolaryngologists, internal medicine, cardiologists and family physicians. For more information, call (888) 371-3920.